transformation. it beckons me so … to stand up tall and face the sun – to be what is necessary – to accept what will become. there’s something in the spring – an excitement – anticipation. all around nature is erupting. the curious crocus bursts through winter’s slumber, squirrels scurry about with unearthed wonders and the giant oak stretches its budded branches wide against the vast, seamless sky. all around nature is surrendering. it’s surrendering to something beyond it – to the spaciousness of grace and to the gravity of mother earth – to the turning of the planets and to the motion of the universe. all around there is the calling of wonder – of splendor – of joy! in the dark it has no name. with divine and cosmic pain. and ascends into his grace. beneath the ground, there is no color – no sound – no name. beneath the ground there is no thought, no belief and no desire – no pain. there is no plan and no willing – no doing. there is no trying to be anything at all – there is only becoming. above, musing space and form come together in a potion of jubilation and impending birth. there’s a rustling of steps and a resounding drumbeat rising amidst the ascension of playful color and sound. that what appears as a drumbeat is merely a part of the whole. change is inevitable and the only way to be prepared for anything in life is to be present for all change. life is dramatic – incredibly sacred and inspiring! the mere fact that we can wake up every day and be reborn into new possibility is a magnificent gift! like the many flowers that burst through the ground to declare their song – when our eyes open and light floods in – we, too, have a song that rings from within – an unnamed, untamed sound with one harmonious mission – to play, to wander in wonder, to trust the ground that holds us. we don’t need to speak the same language – we don’t need to agree upon the lyrics, all we need to do is meet in this space and come together in harmony … to strike the chord of mutual agreement, to meet in compassion. let’s meet in the stillness and space before the formation of sound – before the engagement of will and intent. in the darkness is where we will be found. What happens when intention meets sound? 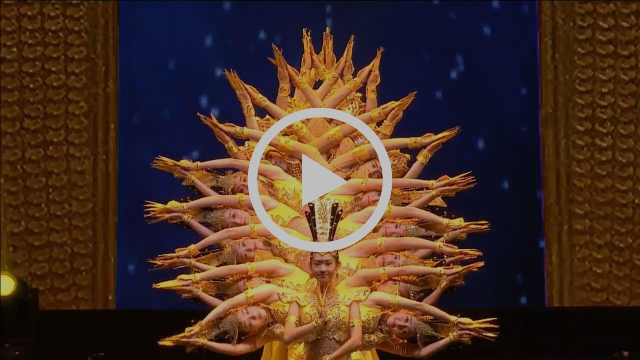 check out the creationary power of acceptance and compassion in this performance of the dance of one thousand hands: the dance of guan yin, goddess of compassion. this dance troupe is comprised of hearing disabled performers. and still, they dance with precision and form … with such grace! it is through the method that they learn the dance of the mind/body/spirit. they come together through the rhythm of their breath – through the vibration of the drum that travels beneath their feet – shifting the attention of their senses in a dynamic dance of motion, creation and transformation.